In 1900, Larmor introduced the unobserved aether concept of time dilation in his treatise “Aether and Matter” (Zhang, p. 175). In 1905, Einstein attempted to convert this absolute concept into a relative one by substituting a relative velocity v between two inertially moving bodies in place of the absolute velocity v relative to the non-existent aether. In section 4 of his 1905 Special Theory, Einstein referred to the “Physical Meaning” of the Lorentz transformation equations “in respect to …moving clocks” (Einstein, 1905d [Dover, 1952, p. 48]). Einstein’s definitions of a “clock” and of “time dilation” were very broad. For Einstein, a clock was any periodic process, such as the oscillations of an atom. “Time dilation” meant the increase in time interval between two periodic events, such as two ticks of a clock or two waves of a light ray, because of a relative velocity. In other words, any relative velocity mathematically resulted in the decrease in frequency of such periodic events (Gill, p. viii; Einstein, Relativity, pp. 41 – 42). Why did Einstein adopt Larmor’s and Lorentz’s artificial aether concept of time dilation for his 1905 Special Theory? Because he needed it in order to make his mechanics Special Theory for the absolute velocity of light appear to work mathematically. After Einstein adopted the aether concept of Time Dilation for his Special Theory, he had to attempt to find some empirical confirmation that this concept actually exists. 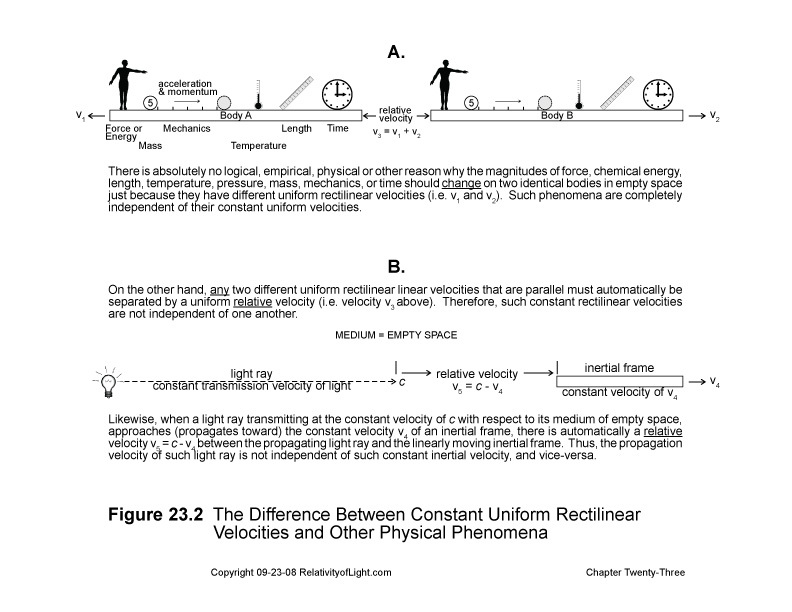 In 1905, the most obvious example of a change in the frequency of a periodic process caused by relative velocity was the classical Doppler effect of light (Chapter 7). However, Einstein’s analysis of the Doppler effect of light was quite different than the classical explanation. In section 7 of his 1905 Special Theory Einstein described his relativistic Doppler principle of light (Einstein, 1905d [Dover, pp. 55 – 56]). Einstein imagined a distant source of light waves in space with an emitted wave frequency f, which light waves are ultimately received by an observer. Because of an assumed relative velocity between the distant source and the observer, he applied the Lorentz transformation equations for distance and time to such light waves and determined an equation for the description of such received light waves by an observer who was relatively at rest. Einstein then imagined that the observer moves at velocity v relative to the light source. Einstein then determined another equation which a priori described the frequency of the light waves when they were perceived by the observer. Einstein concluded that “[T]his is Doppler’s principle for any velocities whatsoever” (Ibid). According to Einstein, before the observer can know the constitution of the waves which he is observing at relative rest, he must first apply the Lorentz transformation to the wavefronts emitted by the source, but before he can do that, he must know their frequency when emitted by the source. However, before the observer can determine the wavefront frequency which he is going to perceive as a result of relative motion, he must first know his velocity vrelative to the distant source. All of these unknowns can only be inferred from observing a classical Doppler shift. Therefore, Einstein’s relativistic Doppler theory is both circular and impossible to compute unless and until an empirical Doppler shift is first observed and analyzed by classical methods. For these reasons, Einstein’s relativistic Doppler equations are meaningless in any practical sense. What was Einstein really asserting? He was mathematically asserting that the relative velocity of the source and the observer (at a distance) caused the distance interval and the time interval between the wavefronts emitted by the light source to physically expand. This in turn caused such wavefronts to be received by an observer less frequently than was assumed by the classical theory. Theoretically, there should be a lesser blue shift and a greater red shift than was being interpreted by the classical method. Mathematically, the magnitude of this relativistic effect increased with an increase in relative velocity. But how can the distance between radiation wavefronts physically expand during their propagation through empty space? Einstein did not enlighten us as to how this physical process (this action at a distance) occurs. Radiation wavefronts are not matter like the longitudinal arm of Michelson’s apparatus, and they have nothing to do with the kinematic motions of matter. 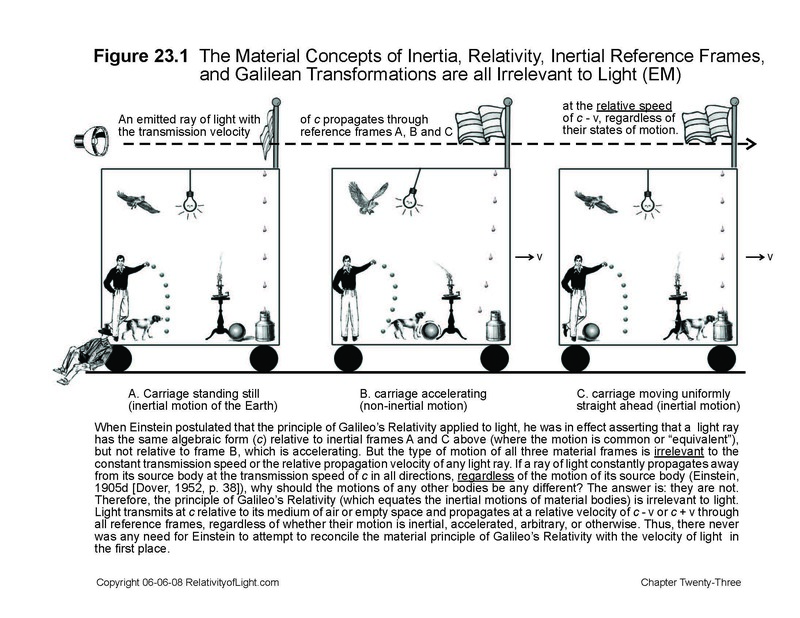 So how can the Lorentz transformations for moving matter have anything to do with them? In the classical theory, when two luminous objects are approaching each other, the distance between their wavefronts decreases relative to the observer and thus they are received more frequently than when at rest. How can the distance between such wavefronts decrease with such relative motion and expand because of such relative motion (in Einstein’s theory) at the same time? Also, if the distance between emitted wavefronts expands to a certain magnitude relative to an observer on Earth (depending upon relative velocity), then they must also physically expand to a specific magnitude relative to every other observer in the Cosmos all at the same time, depending upon their relative velocity and relative direction of motion. This, of course, would be an impossibility for the same reasons as described in Chapter 10A. Einstein’s relativistic Doppler theory is yet another example of his philosophy: “that everything that is mathematically true [or possible] must have a physical counterpart” (Dingle, 1972, p. 125). With the classical Doppler effect of light, the spectral shift is observed to be directly proportional to the relative velocity (or “linear” in mathematical terms). Whereas, with the relativistic Doppler theory, the observed spectral shift theoretically is not directly proportional to the relative velocity, but rather takes a much different arcing geometrical shape (Figure 23.1). Is not the contradictory observed effect empirical evidence that Einstein’s relativistic equations are not correct? This arcing shape results from the application of the Lorentz transformation, and its purpose is a mathematical one: to keep the relative velocity of the two luminous objects always below the speed of light. But this result in turn contradicts current estimates of the radial velocity of remote galaxies; their interpreted radial velocities relative to Earth are far in excess of the speed of light (299,792,458 m/s). Something is amiss. It turns out that such contradictory result was not even necessary for redshifts. Why? Because Einstein’s relativistic speed limit of c for the addition of two velocities in the same direction does not theoretically impose a speed limit on two luminous bodies separating in space in different directions. Einstein’s relativistic Doppler principle only requires a relative velocity v between two inertial bodies (a distant light source and a local observer), light waves of frequency f at the source, and the Lorentz transformation equations. Thus, the relativistic Doppler effect perceived by the observer (the shift of the dark spectral lines) is a priori due to the combination of the motion of the observer and the motion of the distant light source at the same time. In other words, the observed effect theoretically results because of their simultaneous relative velocity; but never because of their unique velocities considered separately, nor because of the distance/time interval delay of c.
Resnick asserted that “the theory of relativity introduces an intrinsic simplification over the classical interpretation of” the Doppler effect…in that the two separate cases which are different in classical theory, namely an observer moving relative to a source and a source moving relative to an observer “are identical in relativity” (Resnick, 1968, p. 91). This claim of identity has also been made by many other relativists. For example, “[T]he relativistic result is a kind of unification of the moving-source and moving-observer results…” (French, p. 137). It follows from the above that (in Einstein’s theory) the relative velocity of the source and the observer produces one and the same effect (either a blue shift or a red shift), and that either the “observation of the movement [motion] is immediate in both cases, or it is delayed in both cases” (Dingle, 1972, p. 216). “We know that, with respect to a distant star, the orbital motion of the Earth round the Sun causes an alternation of approach and recession. The Doppler effect corresponding to this is observed to synchronise with the orbital motion in every case, so we know that, when the observer moves, the effect is seen immediately…That means that the effect must also be seen immediately when the star moves, otherwise there would be an observable distinction between the two cases” (Dingle, 1972, p. 216). Therefore, according to Einstein’s theory, “[E]very Doppler effect observed is a result of a motion occurring at the time (instant) of observation, no matter how far away the source of light may be” (Ibid, p. 217). Let us analyze the implications of these assertions and empirical conclusions. If the relativistic Doppler effect is only due to the combination of the separate velocities of two relatively moving bodies, then the velocity of the light source, no matter how far away, must have an immediate, instantaneous and simultaneous impact on the locally observed effect. This result violates Einstein’s relativistic addition of velocities: that no transmission of information (vis. the velocity of a distant star) can exceed the speed of light. We have devised a simple and straightforward test to determine the validity or invalidity of this simultaneous transmission. If the observed spectrum shifts between the solar orbiting Earth and two nearby binary stars in reciprocal orbits are consistent and correlate with current observations, then such observed shifts must be a time delayed classical Doppler spectrum shift that we are observing (Figure 23.1B). Why? Because our current observations of such binary stars also portray the relative motions of the binary stars that occurred many light-years in the past, due to the distance/time interval delay of c. On the other hand, if there is no such correlation then such observed shift must be a simultaneous relativistic Doppler spectrum shift due to current distant relative motions of the binary stars which we currently observe because of the distance/time interval delay of c. Our money rides on the time delayed classical Doppler shift. The relativistic Doppler concept implies that, without an aether, the separate analysis of the source’s motion and the observer’s motion are always meaningless, because there is no way to determine which body in space is moving. However, observations in local space belie this assertion. For example, the alternations of blue shifts and red shifts observed in light from a distant star is directly correlated with the Earth’s observed solar orbital motion, and can only be rationalized on the basis of such local observation (Dingle, 1972, p. 216; Figure 23.2A). Likewise, the similar spectral oscillations of one observed binary star orbiting another star can only be explained based on such distant time delayed observations (Zeilik, p. 315; Figure 23.2B). The relativistic Doppler concept also implies that the finite transmission velocity of light and the resulting distance/time interval delay of c are irrelevant to the effect. How then does it explain the facts that: 1) the Earth does not change its motion relative to a distant exploding star (a supernova), and 2) we do not perceive a large blue shift associated with the supernova’s fragments approaching the Earth at about 2,000 km/s until we observe the supernova itself (which occurred thousands of light years ago). This time delay for the local observation of such blue shift also contradicts the assertion of the relativistic Doppler effect that the relative motion of the distant light source is part and parcel of every Doppler effect; in other words, that the relative velocity of the light source is observed simultaneously with every Doppler effect. “[Einstein’s] postulate of constant light velocity speaks only of the velocity of light; it does not require that light shall even show a periodity [a frequency of light waves]”  (Ibid, p. 22). “Einstein’s theory of necessity makes a complete divorce between the velocity of light and its frequency, because the velocity is independent of the motion of the source or receiver and the frequency [Doppler effect] varies systematically with the relative motion of those bodies” (Ibid, p. 119). Thus “It would be entirely consistent with Einstein’s theory if there were no Doppler effect at all—i.e. if motion had no effect on the observed frequency of light…” (Ibid, p. 22). “[T]he effect of the motion on the light frequency that is to be ascertained by the observer is not completely given by the Doppler effect. The motion also reduces the (apparent) proper frequency of the emitting ions in accordance with the [Lorentz transformations]” (Ibid, p. 263). Einstein’s mathematical conclusion is, of course, dependent upon his dubious assumptions that the Lorentz transformations are valid and that they should be applied to Stark’s experiment. This so-called confirmation is at best circular; Einstein’s relativistic Doppler effect was intended to empirically confirm his relativistic concept of Time Dilation which was mathematically created by his Lorentz transformations which caused the relativistic Doppler effect, etc. Again, circular reasoning is not very convincing! In fact, there is no experimental or observational proof that the relatively small Doppler velocities observed in local space are anything other than classical Doppler effects. Why? Because any such theoretical variations between classical Doppler effects and a relativistic Doppler velocity are too small to detect or “make themselves evident in practice” (Einstein, Relativity, pp. 49, 50). How convenient for Einstein’s relativistic Doppler effect! “[T]he actual amount of evidence supporting the relativistic Doppler effect formula is not very great at all. It is accepted because the remainder of the [relativistic] theory has to be accepted on the basis of…experimental evidence” (Gill, p. ix). In other words, the relativistic Doppler effect does not support or confirm Special Relativity theory, as Einstein and others have claimed. Rather, the acceptance of the rest of the Special Theory of Relativity supports the relativistic Doppler effect. This mutual and circular bootstrapping of “proofs” and “acceptance” (the acceptance of one dubious theory supports another dubious theory) is not very convincing. The only so-called “confirmation” that classical Doppler shifts change in the way that the Lorentz transformation asserts they do, is Einstein’s Special Relativity theory itself (Einstein, 1905d [Dover, 1952, pp. 55 – 56]). Thus, contrary to Einstein’s assertion, his relativistic Doppler formula is not “found to be in accord with experience” (Einstein, Relativity, p. 55). Logically, the unobserved relativistic Doppler effect cannot be confirmation or proof of the theory which created it…Special Relativity. Einstein’s and his followers also claimed that his relativistic Doppler formula “predicts a transverse Doppler effect, an effect that is purely relativistic, for there is no transverse Doppler effect in classical physics at all”  (Resnick, 1968, p. 90). There is no observed transverse Doppler effect of light for the same reasons that there is no acoustical Doppler effect. The frequency of receipt of the sound waves and the light wavefronts remains constant for the observer who is located perpendicular to the motion. Empirically, if the relative motion of the sound source or the light source is transverse to the position of the observer (they are relatively at rest), then no spectral shift is perceived by either the listener or the observer. However, according to the relativists, the only thing necessary to change the frequency of light wavefronts from the source as viewed by the observer is relative motion. Therefore, according to the relativists, transverse relative motion should also produce an immediate frequency change as received by the observer. “If our line of sight is 90° to the relative motion, then we should observe a frequency v which is lower than the proper frequency v′ of the source which is sweeping by us” (Resnick, 1968, p. 90). In other words, theoretically we should observe a red shift. Resnick goes on to assert, “[T]ransverse Doppler effect has a simple time-dilation interpretation” (Resnick, 1968, p. 90). “The moving source is really a moving clock beating out electromagnetic oscillations. We have seen that moving clocks appear to run slow. Hence we see a given number of oscillations in a time that is longer than the proper time…Therefore, we observe a lower frequency than the proper frequency. The transverse Doppler effect is another physical example confirming the relativistic time dilation” (Ibid, pp. 90 – 91). Let us scrutinize these claims by Resnick. Einstein attempted to convince us that his concept of the Relativity of Simultaneity (time dilation) had merit, but he failed (Chapter 18). So we have not seen that moving clocks appear to run slow. This invalid time dilation concept is then used by Resnick to rationalize the existence of a transverse Doppler effect, which in turn is claimed to confirm the concept of time dilation. Does this circular reasoning convince any readers? Many other relativists echo Resnick’s conclusions (i.e., Bergmann, pp. 133 – 134; Born, pp. 301 – 302; Bohm, pp. 71 – 80). French asserts that the linear relativistic Doppler effect is of the first order, v/c. Whereas, the relativistic transverse Doppler effect is of the second order, a much smaller effect (French, p. 144). “If one is to establish the existence of this transverse, or second-order, Doppler effect…one must be sure that the angle θ is precisely π/2 [90°]. A deviation…would cause the first-order Doppler factor…to swamp the effect being sought” (Ibid). The 1938 canal ray experiment of Ives and Stillwell (and repetitions thereof) have been interpreted by the relativists to be the major confirmations of Einstein’s relativistic Doppler formula as well as the existence of his transverse Doppler effect (French, pp. 144 – 146). In this experiment, radiation (canal rays) emitted from high-speed hydrogen atoms (as compared to hydrogen atoms at rest) resulted in displacements of their spectral lines which were interpreted by Ives as Doppler shifts. Significantly, such rays were not viewed from a 90° angle, but rather from an approximate 6° angle (Zhang, p. 184). The magnitudes of the resulting shifts were similar to Ives’ predictions based on Lorentz’s ether contraction theory. Nevertheless, such results were later also interpreted by relativists “as the first testing high accuracy of [Einstein’s] second order Doppler effect, produced due to time dilation” (Zhang, pp. 183 – 187). Is it persuasive that the rays were observed from an angle of 6° rather than the required 90°? Is it persuasive that the same experimental result is claimed as a confirmation for both Lorentz’s discredited ether contraction theory and Einstein’s time dilation theory? Ives and Stillwell did not consider their experiment as a confirmation of Special Relativity (French, p. 146; Gill, p. 137). Therefore, Einstein’s prediction of a “transverse Doppler effect” is nothing but his unsubstantiated conjecture. It is certainly not experimental confirmation that Special Relativity or time dilation is valid. The fact that there is no empirical spectroscopic equivalent of a relativistic transverse Doppler effect is powerful experimental evidence that empirically it does not exist. Closely related to Einstein’s relativistic Doppler concepts is another attempted confirmation of his Special Theory and its time dilation concept. “…[T]he theory of relativity enables us to predict the effects produced on the light reaching us from the fixed stars…and the effects indicated, which are due to the relative motion of the earth with reference to those fixed stars, are found to be in accord with experience” (Einstein, Relativity, p. 55). Here Einstein was not only talking about the Doppler effect of light, but an effect called the “aberration of starlight” as well (Ibid; Chapter 6). as the denominator) describes the angle of aberration more precisely to the second-order of magnitude (Resnick, 1968, pp. 85-87; Einstein, 1905d [Dover, 1952, pp. 56 – 57]). “affects only the laws for rapid motions, in which the velocities of matter v are not very small as compared with the velocity of light. We have experiences of such rapid motions only in the case of electrons and ions; for other motions [vis. the aberration angle and the resulting miniscule tilting motion of a telescope] the variations from the laws of classical mechanics are too small to make themselves evident in practice” (Einstein, Relativity, pp. 49, 50). Therefore, “the relativistic theory of aberration…leads to the same formula as the older theory [of Bradley in 1728] provided that the velocities involved are much smaller than that of light…[T]here is no observable change in any angular position in relativity theory” (E.B., 1972, Vol. 1, p. 36; Zhang, p. 153). “The resulting annual change in the star’s apparent position in the sky is of exactly the same character, and for practical purposes of the same amount, as is given by the classical explanation discovered by Bradley” (E. B., 1972, Vol. 1, p. 36). “The essential difference from the older theory [is] that only relative motions between observers is involved” (E.B., 1972, Vol. 1, p. 36). In other words, the mythical concept of ether is eliminated, and along with it the 19th century idea that the ether must be stationary for aberration to occur. For these reasons, Einstein’s claim that his Special Theory is confirmed by his theoretically slightly different relativistic angle of aberration remains just his theoretical conjecture. The only experience which the relativistic angle of aberration could in any way be “in accord with” is Bradley’s 1728 experiment. “From this there ensues the following peculiar consequence. If at the points A and B of K there are stationary clocks which, viewed in the stationary system, are synchronous; and if the clock at A is moved with the velocity v along the line AB to B, then on its arrival at B the two clocks no longer synchronize, but the clock moved from A to B lags behind the other…” (Einstein, 1905D [Dover, 1952, p. 49]). This has been called the Clock Paradox. If one assumes (as Einstein did) that a relatively moving clock, “as a consequence of its motion…goes more slowly than when at rest” (Einstein, Relativity, p. 42), then there is no paradox. Mathematically, when the Lorentz transformation for the duration of time is applied to clock A, then a priori an expansion of the time interval between its ticks is what happens (Ibid). But logically, when one scrutinizes Einstein’s concept of the Relativity of Simultaneity (duration), this expansion of the time interval or time dilation does not happen. It is only a verbal illusion (Chapter 18A). And it must be remembered that Einstein’s concept of the Relativity of Duration was the only justification or rationale for his adoption of the mathematical Lorentz transformation. Nevertheless, Einstein’s mathematical clock paradox and his concept that “moving clocks run slow” have been claimed by many relativists to be confirmations of his Special Theory and “time dilation” (Zhang, pp. 175 – 180). In furtherance of these claims, efforts have been made to separate two synchronized atomic clocks on Earth, Clock A and Clock B, and to carry Clock A on an airplane around the Earth and return it to its twin Clock B, in order to see if its greater motion has caused it to run slow (Zhang, pp. 180 – 183). For example, it is claimed than an atomic clock carried around the Earth in an airplane at 900 km/h (0.25 km/s) will have lost time upon its return to Earth. But since such clock is already orbiting the Sun at 30 km/s, and is already orbiting the galactic core at 225 km/s (1,000 times faster than the airplane) a priori it must have already slowed down at least 1,000 times compared to its time at absolute rest. Thus, at absolute rest the atomic clock should be running much faster, but absolute rest does not exist. Does any of this mean anything? Clock A, which is flown around the Earth, may or may not remain synchronous with Clock B, which remains on Earth, for a myriad of reasons. However, time dilation is not one of them. Furthermore, in Chapter 18A we demonstrated that Einstein’s concept of “time dilation” is a myth. Another claimed confirmation for Special Relativity involves the slower than normal decay rate of pions and muons moving from outer space toward the Earth’s surface at high velocity, and the claimed reason is “time dilation” (Resnick, 1968, p. 37; Resnick, 1992, pp. 467 – 468). By now, we know even before discussing this claim that it is invalid, because in Chapter 18A we demonstrated that Einstein’s theory of the Relativity of Duration (time dilation) is invalid on its face. In 1936, a new subatomic particle was discovered in cosmic rays coming from outer space. It had a magnitude of mass between an electron and a proton, and so it was dubbed a “π meson” (short for “middle” in Greek). When atomic nuclei coming from outer space at high velocities collide with nitrogen and oxygen atoms in the Earth’s upper atmosphere they produce a vast debris of π mesons (now called “pions”). Pions are highly unstable and almost instantly decay into a different particle called a “muon,” which behaves like a heavy electron (Close, pp. 57, 69, 71). “The majority of cosmic ray muons decay during their rapid flight through the atmosphere, but the most energetic of them survive long enough to penetrate deep underground” (Ibid, p. 69). On the other hand, muons artificially produced in the laboratory on Earth have a much shorter lifespan of 2.2 microseconds when they are “at rest,” and then they decay into another particle called a “positron” (Ibid). “[T]hus the mesons [muons] illustrate the clock paradox; each meson [muon] carries its own clock which determines the proper time T0 of decay. But the lifetime T observed by a terrestrial observer is much larger…the moving meson [muon] ‘sees’ the distances on earth contracted and is able to pass through considerable distances depending upon its velocity” (Born, pp. 260 – 261). Born’s fanciful explanation for why some muons paradoxically “have” much longer lives and make it to the surface of the Earth (and below) before decaying is not really helpful. It borders on science fiction. Particles do not carry clocks, they do not “see” contracted distances on Earth, and time for the Earth observers is not dilated. Similarly, Resnick states that pions created at rest in the laboratory have an average lifetime of only 26.0 nanoseconds. Whereas, in a certain high-energy particle accelerator experiment, pions created at 0.913c were interpreted to live for 63.7 ns. He concludes, “This effect, called time dilation, suggests that something about the relative motion between the pion and the laboratory has stretched the measured time interval by a factor of about 2.5” (Resnick, 1992, p. 467). Resnick then asserts that the observer in the laboratory measures the distance traveled by the pion in the particle accelerator to be 17.4 meters. “Now consider the situation according to a different observer who is traveling along with the pion at a speed of u = 0.913c. This observer, to whom the pion appears to be at rest, measures its lifetime to be 26.0 ns, characteristic of pions at rest. To this observer, the distance [traveled by] the pion is…7.1 m. Thus two observers who are in relative motion measure different values for the same length interval” (Ibid, p. 468). This scenario attempts to demonstrate and confirm Einstein’s reciprocal concept of the Relativity of Length. Resnick’s explanation for why rapidly moving pions live longer and travel farther also borders on science fiction. Observers do not travel along with pions, they do not assume the pion to be at rest, and they do not measure time and distance with clocks and meter rods. The conjecture that these “paradoxes” are caused by such relative motion is not supported by any physical explanation of the processes involved. The real reasons must involve basic natural physical processes. For example, “Particles, like people, do not die [decay] all at the same age” (Rohrlich, p. 210). The half-life for muons is 2 microseconds (2 millionths of one second). This means that one half of all muons only exist this long. But the other half exist for varying periods, including twice as long, 4 times as long, 8 times as long, 16 times as long, etc., and thus they travel much farther than the average. Unlike humans, where few people live much longer than the average life expectancy of 75, “for particles the range of ages is much longer and cannot be specified in quite the same way” (Ibid). A few muons even exist long enough to contact the surface of the earth and below. This is not a miracle, nor a result of Special Relativity or of time dilation. It is merely the result of a natural physical process. 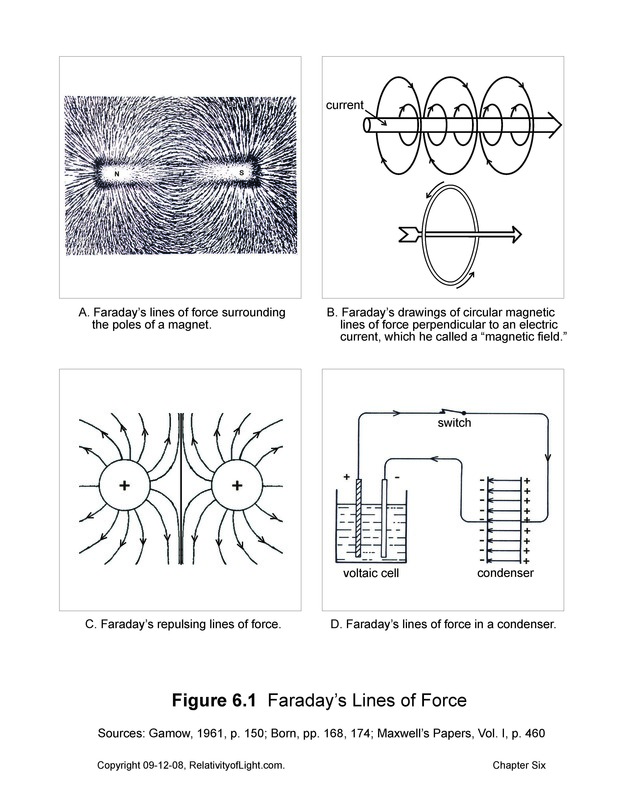 Other phenomena which may contribute to slowing down the decay rate of particles might include: the energy which is applied to particles in an accelerator, the kinetic energy of particles rapidly approaching the Earth, variations in temperature, the varying effects of gravity, variations in the density of the medium, the effects of acceleration and deceleration, the effects of magnetic fields, and the like. More than likely, relative velocity (at a distance) has absolutely nothing to do with decay rate. Regardless of the physical cause, it does not advance science to demand an immediate answer (no matter how far fetched) for every unexplained paradox, nor to interpret scientific metaphors literally. There are other claimed experimental confirmations for time dilation. For example, Einstein’s moving light clock has been cited as a confirmation for Time Dilation (Appendix A). So have the Michelson & Morley experiments, the 1851 Fizeau experiment, and many other so-called confirmations for Special Relativity. But we neither have the time nor the desire to address and falsify each of them, one by one. Most are basically duplications of the claims which we have discussed in this chapter, or very similar thereto. At some point, we must simply refer to Einstein’s fundamental assertions of the Relativity of Duration (time dilation) and our fundamental demonstrations that all of such concepts lack any merit whatsoever. It becomes obvious that the relativists have attempted to overwhelm the skeptics and detractors of Special Relativity with the sheer volume of their claims and interpretations of experiments. For example, they cite at least 12 repetitions of the Michelson and Morley experiments between 1902 and 1930, and interpret each as an experimental confirmation of the Special Theory (Schleif, sec. II). They cite two repetitions of the Fizeau Experiment in addition to the Hoek experiment, and interpret each as a confirmation (Ibid, sec. III). They cite repetitions of the Thornton-Noble experiment and the Kennedy-Thorndike experiment as confirmations (Ibid, sec. IV and VI). They cite 12 experiments between 1906 and 1964 concerning the equivalence of mass and energy as confirmations, even though this concept has nothing to do with the Lorentz transformation and Einstein did not discover it (Ibid, sec X; Chapter 32). They cite over 20 experiments which they interpret to be confirmations of time dilation, the transverse Doppler effect and the Twin Paradox, even though Einstein’s concept of time dilation has been demonstrated to be empirically invalid, and the latter two concepts are merely theoretical examples of time dilation (Schlief, sec. XII and XIII). Many of the claimed confirmations of Special Relativity are actually contradictions of Einstein’s Special Theory, such as the Kennedy-Thorndike experiment, the M & M experiment, the 1851 Fizeau experiment, the increase in electromagnetic mass with velocity experiments, and the failure to spectroscopically observe a transverse Doppler effect. What the relativists have failed to achieve with quality (empirical confirmation), they have attempted to achieve with quantity (strained, redundant, invalid, and unconvincing interpretations).